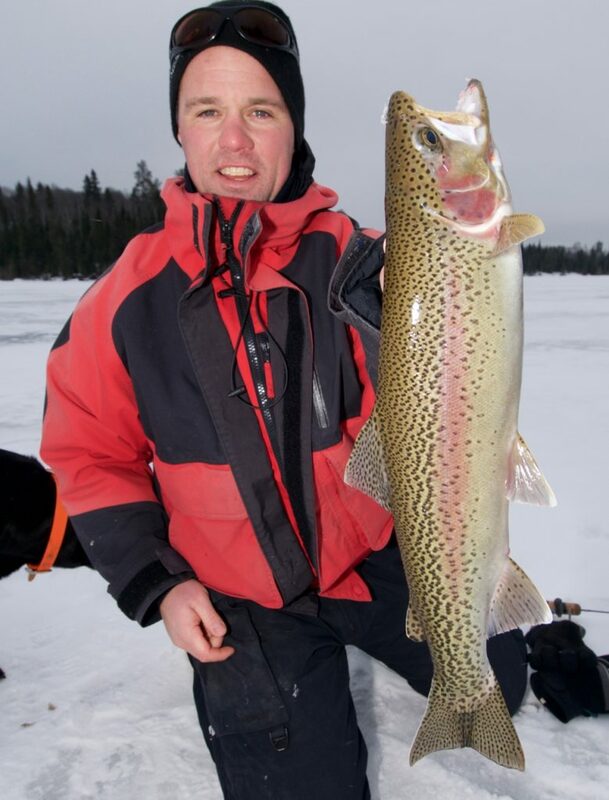 As with targeting brook trout under the ice, you also tend to catch rainbows in shallow water. But in this case, the shallow water is the first few feet of water below the ice, in water that is overall much deeper. I suspect this inclination to suspend high in the water column, along with a penchant to remain much more mobile, is a reflection of the rainbow trout’s Pacific Coast heritage. That said, you can also find rainbows relating to the bottom as brook trout do. The first thing I look for is a shallow, weedy bay when I’m ice fishing on a rainbow trout lake, or on a body of water that rainbows share with brookies. I’ll typically catch brook trout on the fertile flat, and nab rainbows at the mouth of the cove. If the water is only eight to nine feet deep, the rainbows will be cruising in the middle of the water column. And if there’s a distinct breakline near the mouth, you’re likely to find the pot of gold. The same goes if the lake ends in a shallow, finger-like shape. Several years ago, my good friend Doug Stange, host of TV’s In-Fisherman, revealed another secret winter rainbow hideout. We were filming an episode of his show when he told me how he looks for any spot on the lake where deep water cuts into a large, shallow area. The intrusion can be 20, 30 or more feet deep, and the rainbows will gather in the corral, roaming between five and 15 feet below the ice. “I look for the drop-off, then get 50 paces away from the edge, but the fish can pretty much roam anywhere in the corral,” Stange said. “They cruise up and down the drop-offs, so points are potential hot spots.” And as Stange and I discovered that day, the best points are typically not the obvious-looking ones. For some inexplicable reason, short, non-descript secondary and tertiary points tend to produce more fish. If you restricted me to a single type of jigging lure to catch winter rainbows and brook trout, it would be the smallest models of horizontal glide baits, such as Rapala’s Jigging Rap (above), Acme Tackle Company’s Hyper-Glide, Freedom Tackle’s Turn Back Shad and Lunkerhunt’s Straight Up Jig. In the on-deck circle, meanwhile, I keep a stash of the smallest gold-and-silver models of the Williams Wabler, Mepps Little Wolf and Acme’s Kastmaster. As with jigging for brook trout, I use a medium-action jigging rod spooled with eight-pound-test neon Sufix Performance Ice Fuse line, along with a 14-inch stretch of six- or eight-pound-test Maxima Ultragreen for the leader. 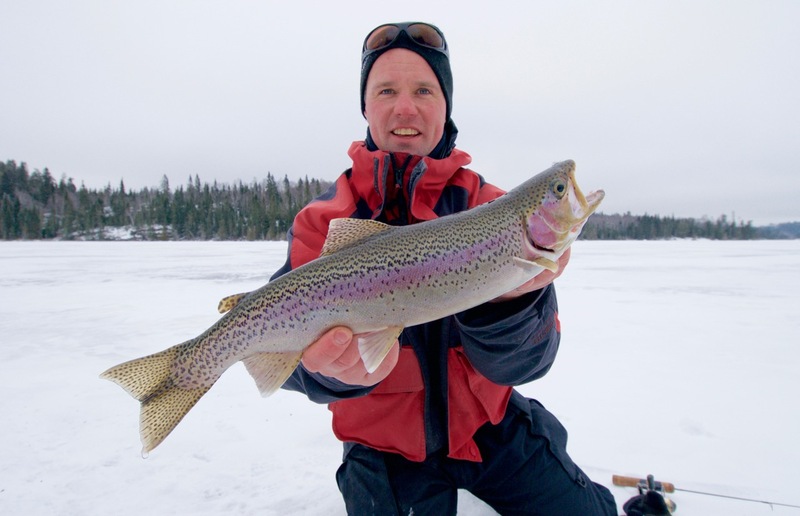 In the clear water that distinguishes most trout lakes—where the fish are visual predators that can see well into the distance—you often need to catch their attention before you can trigger them to bite. That’s why my standard presentation is to briskly snap up the lure using a combination of wrist motion and arm lift. Then I pause the lure for a second before letting it tumble back down under controlled slack line. I do this quickly three or four times, then let the lure hang perfectly still for several seconds. Finally, I shake it ever so gently so that I only rock the treblehook back and forth. If that doesn’t provoke a strike, I start the process over. To help seal the deal, I tip both the front and back single hooks on horizontal glide baits with maggots or the end of a nightcrawler. I also sometimes tip the treblehooks on spoons with maggots, but I’m more likely to use a small piece of belly meat from a cisco or herring. The attracting phase of the jigging motion, combined with the gentle rocking of the maggot or belly-dressed treble, is more than any rainbow (or brook trout) can stand. 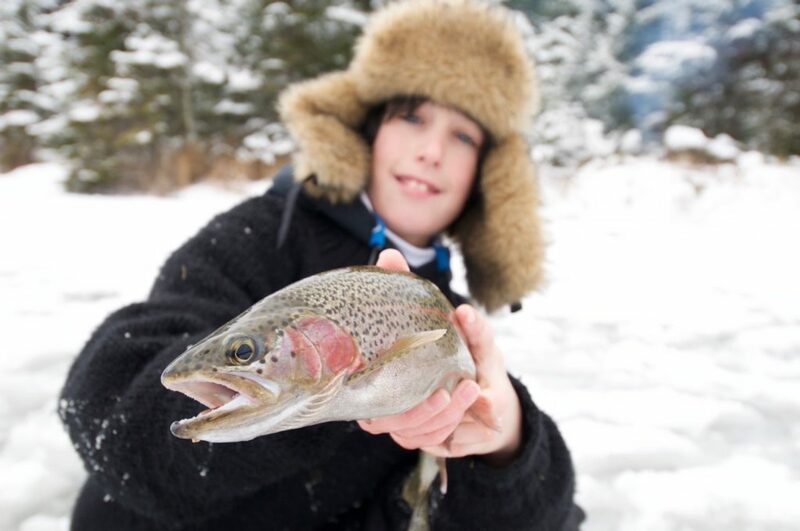 Every Friday this winter we’ll be sharing Outdoor Canada’s coolest ice-fishing tips for 2019. Check back often for the latest tackle, tips and techniques for icing more walleye, trout, perch, northern pike, lake trout, crappies and whitefish.